Does anyone singing this song realise how much they (we) are part of the problem, or that the UN’s Sustainable Development Goals are NOT going to fix a system that has inequality and oppression built into it? I don’t really want to give this any more oxygen. But. Really? “For British politicians, foreign aid to Africa has become a cherished emblem of our idealism and generosity.” But this is a powerful story we’ve been told. The following article details yet another tale of foreign ‘aid’ and corrupt governance (on all sides) doing irreversible damage to the lives and livelihoods of the supposedly intended recipients. I’d strongly recommend you reading the full article, but it’s a long read, so I’ve pulled out a few of the paragraphs I found most interesting and poignant. “Ethiopia is in a race to develop. In a similar fashion to Rwanda, the authoritarian government, lacking a democratic mandate, has staked its claims to legitimacy on its ability to deliver economic growth, and it is in a terrible hurry. During the past decade, Ethiopia has pursued a Chinese-style rush to develop its economy: locking up dissenters, crushing the opposition with a succession of 99% electoral victories, and building massive road, rail, agribusiness and hydropower schemes without pausing to conduct the necessary social and environmental impact assessments. “In Gambella, the government’s plans for delivering these things took the form of villagisation. The inhabitants of Opik’s village, though, were mistrustful of the government’s intentions. There had been no dialogue, no consultation. If the government had done little for them before, why would they suddenly start caring now? They suspected a plot to steal their land. They had heard of investors coming to test soil in certain areas. “The Anuak had to wait 10 months for a clue. In October 2012, after questions were asked in the British parliament, the findings of the DfiD visits were quietlydeposited in the House of Commons library. They described massive flaws in the villagisation programme, inadequate services and insufficient food, possibly requiring an emergency response. “Of all the academic economists working on Ethiopia, I could not find one who was willing to speak on the record for this article. Much of the professional field of development studies is dependent on DfID research grants, with many academics serving on multimillion-pound study teams. 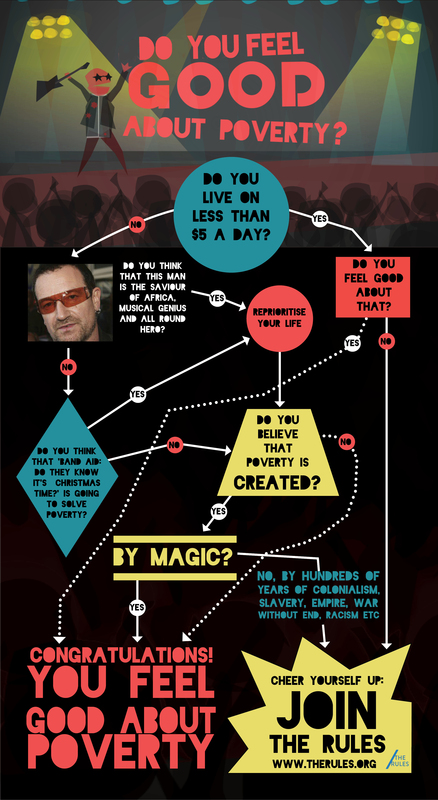 Have you ever thought about how #PovertyIsCreated? Have you eaten today? If not was it because you chose not to or because you didn’t have enough money to do so? And if you have, did you have to think carefully about what you could afford, or did you eat whatever you fancied? Whoever we are, and however much money we do or don’t have, a lot of the time we’re so focussed on living our daily lives we (understandably) don’t stop to think about how we’ve got to where we are – whether that’s making difficult choices about how we spend our last few coins, having so much money we don’t know what to do with it, or something in between. It’s also easy to forget how connected our lives, and our money, really are. We can all get our heads around the idea that if someone takes too much of something, someone else will have less, but when it comes to poverty we’re often told that ‘we’re born into it’, or ‘it’s just the economy’, or ‘the wealth will trickle down’, or ‘we’re just lazy/unlucky/unfortunate’. These are such powerful stories that they’re easy to believe, but they all hide the fact that poverty is created – it doesn’t happen by chance. Imagine two children – one child grows up in a house that’s warm and dry, with shelves full of books and a fridge full of food; parents who can afford to stay at home and look after them; a private education in a well-resourced school with teachers who love their jobs; and, as an adult, access to loans and internships and connections. Today they live comfortably, with a lifestyle like their parents and children of their own. The other child grows up in a damp, noisy, busy house, with parents who must work several jobs; education in a school with large classes, little funding and stressed teachers; and, as an adult, no access to loans, financial commitments at home and little help finding work. Today they live in poverty, with a lifestyle like their parents and children of their own. Imagine two countries – one country fosters innovation and develops its industries; it travels across the world to trade with other civilisations; it manufactures weapons which it sells to others; it forces millions of people from other lands to leave their families, jobs and lives to work for them in slavery; it divides up continents and groups of people and rules over them – creating new countries where citizens must work power the empire’s economy; its companies take billions of dollars of resources from other countries without fair retribution whilst damaging ecosystems; it lends money to other countries with an expectation to be repaid with interest; it teaches its values, religion and worldview and wages war on countries and people who do not play by its rules. Now this country is (largely) economically, politically and societallystable, with a large proportion of its population living comfortably above the poverty line. The other country fosters innovation and develops its industries; it begins trading with visiting nations from overseas; it buys weapons manufactured there; millions of its people are forced to leave their families, jobs and lives to work abroad in slavery or are killed; its people are divided up into new territories and ruled over by foreign countries and forced to grow crops to power foreign economies; its resources are extracted by multinational corporations from abroad and both produce and profit are sent overseas leaving only environmental devastation; it borrows large sums of money from other nations to try and compensate with so much interest it can never be repaid; its values, religions and worldview are criticised, undermined and systematically destroyed, and it is physically attacked if it doesn’t play by the rules. Now this country is economically, politically and societally unstable, with a large proportion of its population living in poverty and hunger. There are hundreds of stories, just like these, that show that poverty exists because it is created. You only have to do the maths… the 85 richest people in the world have the same amount of wealth as the poorest 3 billion. Is that just a coincidence? Every year 18 times more money leaves poor countries in the global south than trickles into them... and we wonder why they’re poor? This month, the United Nations’ Sustainable Development Goals are telling us a good-news story, and it’s one we all want to hear – that things are getting better and that if we keep doing things largely in the same way, with charities and technical fixes we can end centuries of global poverty creation by 2030. Don’t get me wrong, I too would like to end global poverty by 2030, but we think that it’s not going to happen until we start admitting that poverty is created, not a state of nature, spot of bad luck, or a disease that humans can ‘cure’ but don’t ‘create’. When we’re really honest about what’s going on, then we can look at breaking the creaky, archaic, unfair rules with game-changing and exciting possibilities like updating the money system so that it doesn’t just create debt; moving to a steady-state economy so that it’s in balance with nature; putting limits on the power of big companies so that we can have real democracy; or considering a basic income for everyone so we can spend less time fighting and more time loving, and where both of the children and the citizens of the countries we talked about earlier would share fairer, more equal lives. Originally posted on TheRules.org on 7th September. It’s been a mad month as I’ve started working with www.therules.org, which, as you can imagine, is a dream come true. We’ve just launched a campaign based on the idea that #PovertyIsCreated in advance world leaders coming together in New York later this month to formally sign the United Nation’s Sustainable Development Goals (SDGs). The SDGs will be met with fanfare: celebrity endorsements, photo ops and a general air of celebration. These goals will set the international development agenda for the next 15 years and will affect the lives of millions of people, but what they are proposing is business as usual – grow the global economy and wealth will trickle down to the poorest. We know this won’t work, because between 1990 and 2010 global GDP increased by 217%, but the number of people living in hunger and poverty has actually increased. The UN has lots of answers for reducing poverty, but it’s not asking the right questions. The UN’s Millennium Development Goals set in 2000 have grown economies, but left 60% of the world’s population living in poverty and contributed to the continued destruction of the planet. How can we sustain growth when we’d need 4.1 earths for everyone to live like an American? And if growth works, why does all the money end up in the hands of the few? – Even now the 85 richest people in the world have the same amount of money as the poorest three billion and 18 times more money flows out of the global south every year than trickles into it. We need to start asking the BIG QUESTIONS about poverty, because if we can expose its root causes we can get real answers about how to eradicate it and change the rules for a world that works for all. With the UN and the SDGs under the media spotlight for the next month, we have a unique opportunity to tell the true story of poverty and how #PovertyIsCreated with videos, articles, tweets and other messages. This is the first step to steering the conversation towards solutions that can truly alter the system to stop creating poverty and change the rules for a world that works for all. We need to make sure our message reaches as far as possible. Please watch and share our short video to find out the big questions we need answers on, and soon.